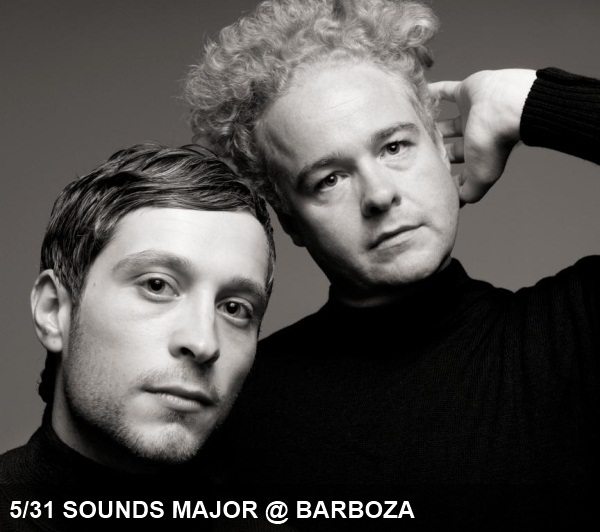 Those of you keeping track will notice we’ve been really enjoying the acts that Barboza has been able to book since its recent debut. Tonight is no exception. While we’ve been fans of Kay Kay and His Weathered Underground since we first heard the band’s earlier cabaret-style, Sgt. Peppers-inspired take on rock, we’re most excited to hear what pianist Kyle O’Quin’s other band playing that night have been up to as of late. Kyle, who many may know first from his time with Gatsby’s American Dream, has teamed up with Sean Nelson of Harvey Danger and The Long Winters fame just about a year ago. After a name change or two, Kyle and Sean have settled on the name Sounds Major. We were lucky enough to see one of the band’s early shows with Cataldo and have been fans ever since. If you’re a fellow fan of sharp-tongued piano-driven pop, you won’t find a better place to spend your evening than in Neumos basement.